2019 Date To Be Determined! Spin for Kids is a fund raiser by Camp Twin Lakes. Camp Twin Lakes allows its partners (FOCUS is one!) to form teams in Spin for Kids and raise money to support the partners’ programs. For the eighth year, TEAM FOCUS will ride in Spin for Kids to raise money to support FOCUS programs at Camp Twin Lakes. Our goal is to raise $35,000 so the cost of camps can be kept low to children and families. TEAM FOCUS includes medical professionals, triathletes, and FOCUS friends, parents and kids! 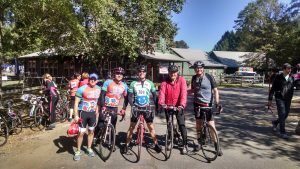 Ride as few as 5 miles or as many as 100 miles – or support by donating to TEAM FOCUS or your favorite rider! About Spin for Kids: Spin for Kids is actually a fund raiser for Camp Twin Lakes, a network of camps providing life-changing camp experiences to thousands of children with serious illnesses, disabilities, and life challenges. While Camp Twin Lakes works hard to keep the cost low for its Partners, there are still significant costs to FOCUS. Our total fee to Camp Twin Lakes is $45,000 each year. The proceeds TEAM FOCUS raises at Spin for Kids 2019 directly offset the costs of FOCUS programs at Camp Twin Lakes in 2020….we’ll start the year with a credit! !